Salmon Tree Cycle- A new gateway sculpture for the city of St Helens Oregon. We are excited to have been selected and to be working with the community and City of St Helens. 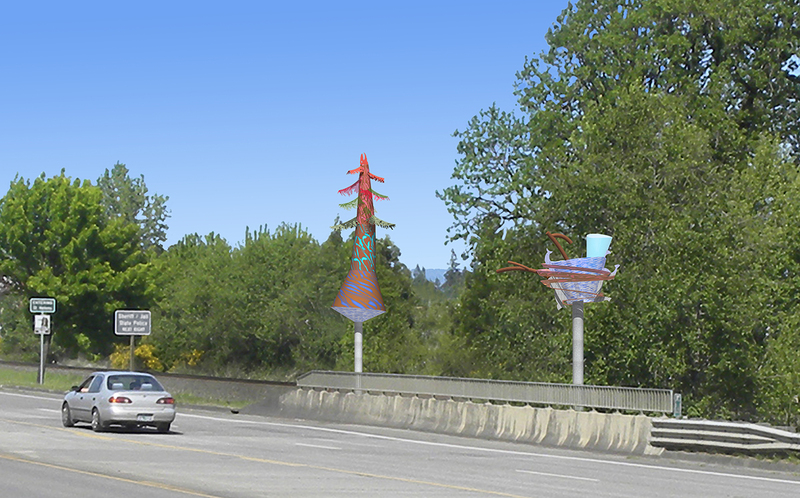 The new gateway sculpture entitled Salmon Tree Cycle will be located at the south entrance to the city along hiway 30 at the McNulty Creek bridge crossing. We will be creating two torsional, organic lanterns. The pieces frame McNulty Creek and symbolically represent a flowing, Columbia Basin river culture sustained by the integral ecosystem of trees and salmon. Salmon migrate from freshwater to ocean and back. Their bodies are repositories of nitrogen and numerous nutrients that not only benefit predators and scavengers but are also critical fertilizers for stream-side trees. * The roots and branches of these trees in turn become the habitat for a healthy, diverse water system. The Salmon Tree Cycle is a sculptural expression of this dynamic reciprocity. Though structurally independent, both parts of the sculpture work in concert to create a gesture of transformation. The North lantern sweeps upward while the South lantern whirls outward and down – an experience that becomes sequential by the movement of the motorists in either direction. Composed of painted, laser-cut steel shells and internal translucent, UV-stable, colored panels – the pieces will be vividly present both day and night. During the day the sculptures mark the water being crossed – gestural forms (of salmon and large woody debris**), shifting gradients of openness and color create a shimmering effect. At night, internal LED lighting illuminates the colored panels and brings to life the negative space created by the steel cut-outs. The piece will be expressive from close-up and from afar.